This month, as signs of spring begin to emerge in the northern hemisphere after a somewhat harsh winter in many temperate countries, Singapore faced what was one of the driest months in 140 years! The National Environment Agency (NEA) in Singapore reported that February 2010 saw only 6.3mm of rain. February, traditionally one of the driest months in a typical year, was made worse by the El Nino effect, and the hot dry weather is expected to last until May. Our butterflies though seemed to be still quite happily fluttering around, with more discoveries and new observations being recorded by members of ButterflyCircle. 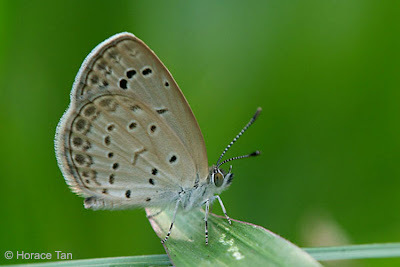 Whilst the news of these interesting observations will be recorded in due course on this Blog, we feature a relatively common and small Lycaenid for the month of March 2010 - The Pale Grass Blue (Zizeeria maha serica). 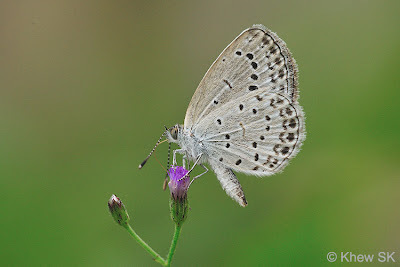 The Pale Grass Blue is one of our "foreign talents" that arrived in Singapore some time before 2001, and have remained ever since. 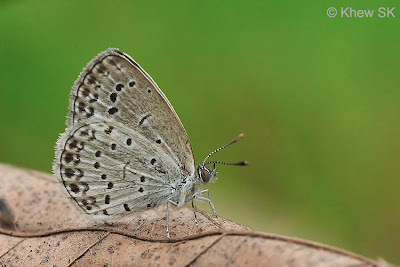 A species that was not on the records and checklists of the early authors, the Pale Grass Blue was first discovered by ButterflyCircle member Steven Neo, and his son Abiel Neo back in October 2001. Steven tells me that whilst photographing butterflies at a hedge near his home one day, and after developing the film (yes, in those days, digital cameras were non-existent or exorbitantly out of reach of the masses), he got a shot of a rather strange Lycaenid that did not match the species in reference books for Malaysia/Singapore butterflies. It remained an unidentified species until in Nov 2002 when I communicated with Col John N Eliot, the butterfly guru who was responsible for the 4th Edition of the Butterflies of the Malay Peninsula by Corbet & Pendlebury. Col Eliot confirmed that the photos of the specimens that I sent to him were indeed Zizeeria maha serica of which the type specimen originated from Hong Kong. 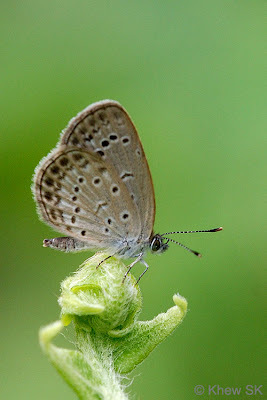 He opined that the little butterfly probably arrived in Singapore, aided inadvertently by human agency, as a butterfly with a wingspan of no more than 15mm was unlikely to have flown here on its own steam. 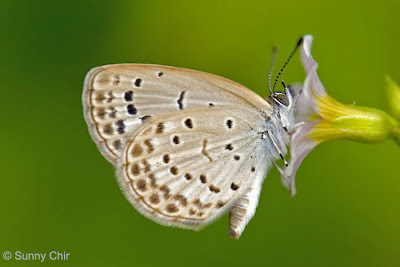 Col Eliot wrote an aerogramme to me on 12 Nov 2002, and another one on 9 March 2003, discussing the discovery of Zizeeria maha serica and other news about Singapore's butterflies. Those aerogrammes are safely preserved in my archives today, and our discussion about this rather diminutive and 'insignificant' butterfly must have been one of the last few that Col Eliot wrote about. Sadly, just about a month after he wrote to me on 9 March 2003, Col Eliot passed away on 11 Apr 2003, being well over 90 years of age then. The world of Asian Lepidoptera lost one of its foremost and most accomplished expert who had contributed immeasurably to the knowledge of butterflies in the region. 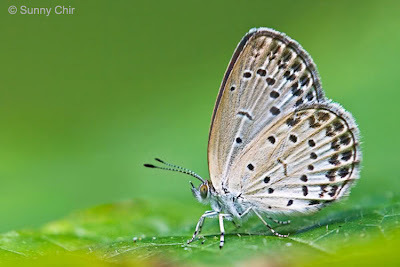 We now come back to the little butterfly, the subject of our discussion, Zizeeria maha serica or what we prefer to refer to as the Pale Grass Blue. 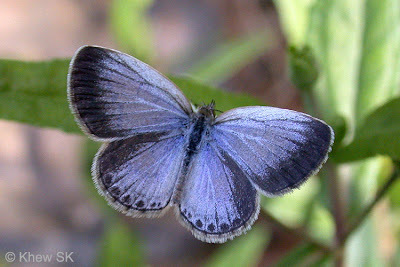 The male of the species is light purplish blue above, with dark bluish black borders on the forewings and costal margin of the hindwings. 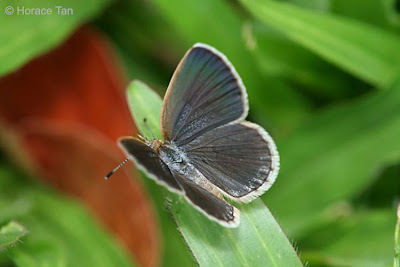 The submarginal spots on the hindwings above separate it from the two similar looking species in Singapore - Lesser Grass Blue (Zizina otis lampa) and Pygmy Grass Blue (Zizula hylax pygmaea). The female is predominantly dark greyish blue above. 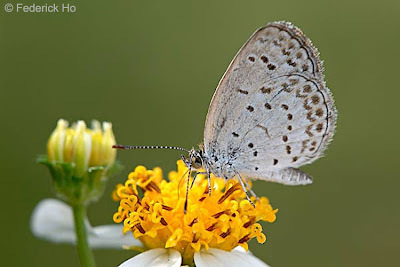 On the underside there is a series of dark spots on the forewings and hindwings. The more prominent submarginal spots and markings on both the fore and hindwings set it apart from the other two lookalike species. 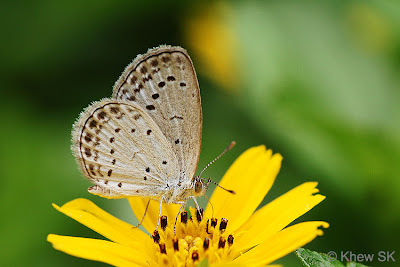 The Pale Grass Blue can be found mainly in urban parks and gardens, where its preferred caterpillar host plant, Oxalis corniculata (Oxalidaceae) or the Yellow Sorrell is found. It has a rather restless erratic flight but a relatively weak flyer. It flies low and close to grassy turfs and stops to feed on wild flowers. Occasionally, individuals are observed resting in the shade with their wings folded upright.